Union textile minister Smriti Zubeen Irani on Saturday made an effort to strike cord with women electorates in Meghalaya’s Dalu and Zikzak in Garo hills by instilling hope and commitment of Prime Minister Narendra Modi, who ensured free gas cylinders to poor household. “Women in India work tirelessly cooking food in traditionalchulhasto bring smile in their children’s face. Modi ji decided to provide gas cylinder to poor women to ease their problem. The corporates had apprehension that poor will not be able to pay but Modi ji requested the rich beneficiaries to give up their gas subsidy, so that the benefit can reach the poor and needy,” Irani said while reminding the crowd that the initiative has benefited over three crores women in the country as one crore people withdrew their gas subsidy. Instilling hope in Modi’s dream for India, Irani accused the Congress of failing in its responsibility for 50 years, which Modi made it possible in three years. Irani arrived from Guwahati by a chartered helicopter at Dalu to campaign for sitting member of Garo Hills District Council Kurosh R Marak, who is contesting the poll from Dalu constituency in West Garo Hills. She was accompanied by Assam MLA Numal Momin and BJP national spokesperson Nalin Kohli. 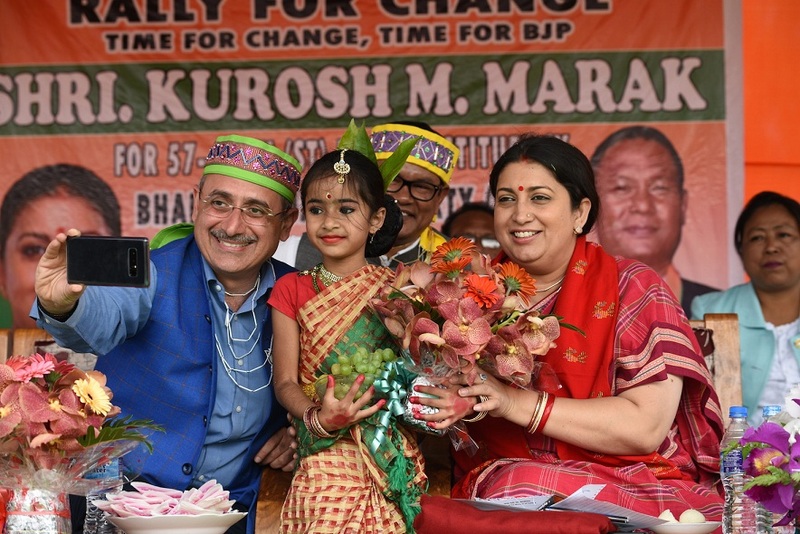 Making her pitch as a womenkaryakartaof BJP in poll bound Meghalaya, where BJP has fielded 48 candidates, Irani said, “Meghalaya has a unique culture and tradition and the confidence of women and children is fascinating. Our party believes in empowering women and we will be able to drive the agenda in Meghalaya to further their cause”. Last year, an incident of sexual assault took place in an inn belonging to the son of Meghalaya home minister HDR Lyngdoh which became cannon fodder for Irani to take a jibe at Mukul Sangma. She reminded the people of the incident involving the home minister’s son in Shillong. “The job of a home minister is to protect women and children but in Meghalaya it is reverse. It is sad and shocking that in Meghalaya where women are held in so high esteem such incident could happen that has ashamed the state,” she said. Irani promised a dedicated women-police force would be in place to ensure security of the women. “The pride of women has to be restored and we will ensure that women in Meghalaya feel safe, secure and independent”. Accusing Mukul of posing obstacle on the implementation of central scheme, Irani said, “In absence of proper health care facilities our people have to avail treatment in neighbouring Bangladesh. This is a blot on Congress government that they have not been able to provide healthcare services to its people. Modi ji has subsidized rate of crucial medicines but Mukul has failed to provide those medicines to the people of Meghalaya”. Irani also interacted with the crowd and sought their opinion on the health care facilities available at Dalu. The people in loud voice responded that they have to go to Tura or Guwahati for better services because nothing was available at Dalu community health centre. In Dalu, BJP’s candidate Kurosh Marak is in a three cornered fight with NPP candidate Brening Sangma and sitting Congress MLA Kenethson R Sangma. A crowd of over 3000 people attended the rally, which was labeled as “rally for change”.